The Russian Army has decided to upgrade the current T-72B3 to a new configuration, which was first seen in the middle of last month. The exact number tanks upgraded has not been disclosed yet. The tank has been called "T-72B3M" or "T-72B4" by different websites, suggesting that the new designation may also not have been revealed yet. 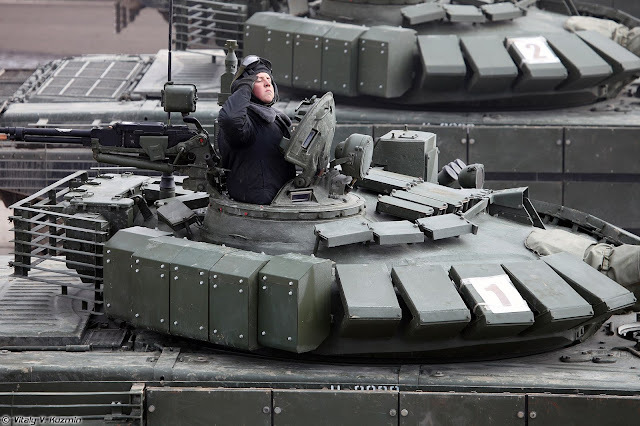 It might be known as "T-72B3 mod. 2016" rather than receiving a completely new designation. The upgrade is aimed to improve the survivability of the tank by installing explosive reactive armor (ERA) at the flanks of turret and hull. This armor is apparently identical to that used on the current version of T-90MS "premium" export tank. This reactive armor is not known to provide protection against kinetic energy ammunition such as APFSDS rounds nor against anti-tank guided missiles (ATGMs) or rocket-propelled grenades (RPGs) with tandem shaped charge warhead. Specifically on the turret sides the ERA boosts protection level considerably, because the T-72 and other Soviet-designed tanks rely mostly on turret geometry to obtain a high level of protection while staying at a relatively low weight. The turret flanks are covered by the heavily armored turret cheeks along the ±30° frontal arc, which allows having only very thin steel armor at the turret sides - about 70 to 120 milimetres thick (depending on location and variant). 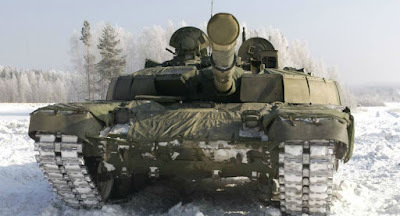 In conventional warfare, the turret design of the T-72 is not considered to be a drawback, because the overwhelming majority of hits will occur within the frontal arc, as proven by the analysis of damaged and destroyed tanks. However it's turret design is a major reason why the T-72 is not suited for irregular or hybrid warfare. When the side armor is hit during an ambush, it can be penetrated by even the oldest and weakest RPGs. Meanwhile the turret side armor of the other tanks such as the Challenger 2, Leopard 2 and M1 Abrams is already much thicker - usually more than a feet (~300 mm) thick - this is believed to be enough to resist att least older types of RPGs. To deal with ATGMs and more modern RPGs, additional urban warfare packages have been developed and adopted on numerous modern main battle tanks, including the C1 Ariete, the Challenger 2, the Leclerc, the Leopard 2, the M1 Abrams, the PT-91/T-72 and the T-84M. The Russian Army is rather late with adopting the new armor package. Nine relatively large ERA modules are added to the turret sides of the tank: five are mounted on the right side of the turret, providing rather good armor coverage. Only four ERA modules are installed on the left side of the turret however, because there is a large gap caused by the smoke grenade dischargers. This area should be considered a weakspot that still is susceptible to penetration by even the oldest types of RPGs. The original T-72B upgrade with Kontakt-5 reactive was a rather "cheap and dirty" attempt to boost the protection of the tank, not trying to focus on perfect coverage, but rather being a low-cost option. This resulted in the old smoke grenade launchers being kept, rather than relocating them ontop of the ERA or on the turret roof, where they wouldn't cause a weakspot. Other tanks such as the T-80U and T-90 have a much better ERA layout. On each side of the hull there are twelve rather large, but thin, panels of reactive armor. Each panel might hold multiple reactive elements in order to maximize multi-hit capability - at least this design was used on the Kontakt-5 hull flank armor panels. Below the reactive armor modules is a rubber sheet with a zigzag pattern at the lower edge. In most cases it won't provide any armor protection, but can affect how much issues are caused when driving at high speeds through dirt and dust. At the rear sections of the turret and at the engine compartment in the hull, slat armor has been installed to provide a weight efficient protection solution against older types of RPGs. With the original T-72B3, the Russian ministry of defence (MoD) settled for a rather poor upgrade of the T-72B tank; at least in terms of armor protection. The old Kontakt-5 armor is still utilized and it is covering only a relatively small part of the frontal aspect of the main battle tank: there are gaps inbetween the ERA tiles mounted to the turret, while the gun mantlet, aswell as the lower and upper portions of turret and hull are not even covered by it. The cast structure of the T-72B's turret is known for leading to inconsistent armor thickness - supposedly resulting in several weakspots according to articles in Russian language; the lackluster ERA coverage only increases this issue. Except of a single ERA tile located left to the main gun, the frontal protection hasn't been altered with the new upgraded variant. The Kontakt-5 ERA is outdated by modern standards - modern ammunition from NATO and other countries has been specifically optimized to defeat Kontakt-5 and similar types of explosive reactive armor. UralVagonZavod (UVZ), the company responsible for manufacturing the T-72B, T-90 and upgrades thereof, has developed much more capable solutions to enhance the survivability of the T-72 main battle tank. One of the better upgrade options is the T-72B2, which was first shown to the public in 2006. Like the T-72B3, this sub-version of the T-72B features a similiar fire control system (FCS) designed around the Sosna-U gunner's sight, which includes an optical day channel, a laser rangefinder and a French-developed Catherine-FC thermal imaging system. Unlike the current Russian T-72B3 variant however, the B2 upgrade features the latest generation Relikt ERA, which provides enhanced protection against ATGMs, APFSDS ammunition and RPGs. It is claimed to even have some anti-tandem-warhead capabilities. While the tank lacked the extensive ERA package at the turret and hull sides, slat armor was fitted to protect the sides against RPGs at least. 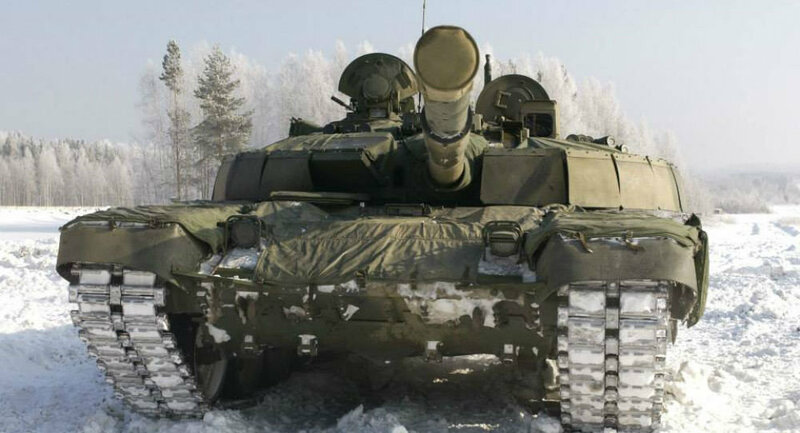 The T-72B2 tank is also fitted with a Nakidka cover to reduce the thermal and radar signature of the tank. At the KADEX exhibition in 2016 in Kazakhstan, UVZ presented an urban warfare kit for the T-72 tank, which also utilized the superior Relikt armor rather than the old Kontakt-5. 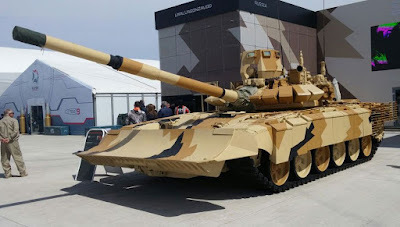 Instead of using the same side armor as the T-90MS, this tank was fitted with a heavier ERA package at the hull sides, which appears to be similar to the one used on the more advanced T-14 Armata MBT. The urban warfare kit has worse ERA coverage at the turret sides (due to the different smoke grenade launcher configuration of the tank used to demonstrate the optional upgrade), but like the T-72B2 it includes the laser warning system from the Shtora-1 electronic countermeasure. A T-72B3 with such an armor kit should be considerable better than the T-72B3. 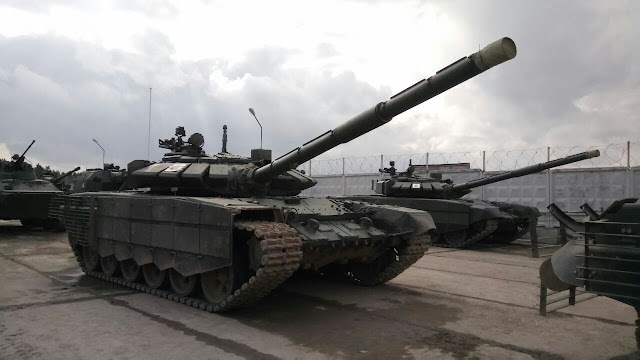 Supposedly UVZ offered to upgrade the Russians T-72B3 tank to an enhanced T-72B2 configuration, including an additional ERA package similiar to the T-72B3 mod. 2016 (aka T-72B3M or T-72B4 according to other websites) and a new independent commander's sight to enable hunter/killer operations at day and night. This upgrade was - like the previous T-72B2 upgrade - considered to be too expensive for the Russian MoD. Some of the T-90 tanks will be upgraded to a new configuration developed as part of Proryv-3 (breakthrough 3) program. 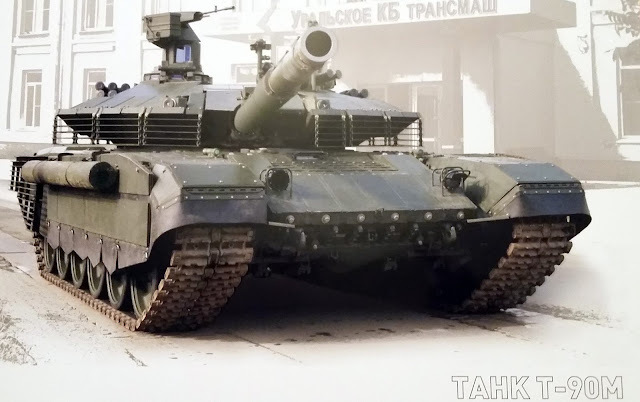 This enhanced version is understood to be largely based on the T-90MS, but introduces new slat armor covering the lower half of the turret front to further minimize weakspots - at least according to photo was leaked via a Russian calendar that was created in corporation with the corresponding institutions. A model of the T-90M was first presented in 2011, but the tank still hasn't been adopted in Russian Army service. If and when Russia will adopt the upgraded MBT in a significant number is currently unknown, but there still is a relatively large time slot until the next-generation T-14 Armata tank will have entered service in reasonable numbers. 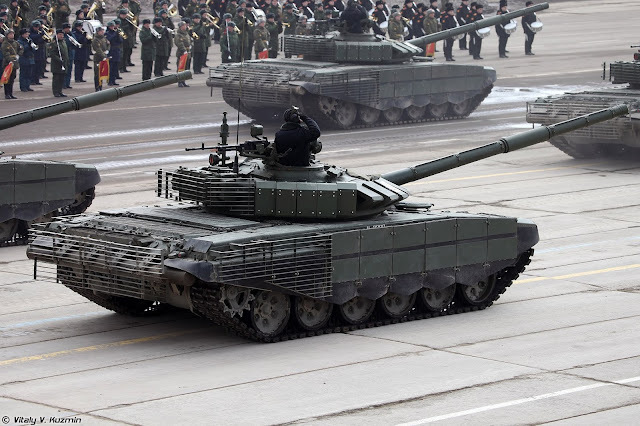 With the upgrades the weight of the T-90 tank is supposed to reach 50 metric tons. I don't know where are we heading towards, all the countries are so much into buying more battle troops. Why can't we live in peace? The ERA on the turret side is quite bulky, so I believe it is somewhat effective against APFSDS and ATGM. Otherwise I don´t see a reason for being so bulky. I love your blog, could you please make a article about "ERA-solutions without APS" to beat tandem ATGM´s.